A multiprotein complex (or protein complex) is a group of two or more associated polypeptide chains. The different polypeptide chains may have different functions. This is distinct from a multienzyme polypeptide, in which multiple catalytic domains are found in a single polypeptide chain. Protein complexes are a form of quaternary structure. Proteins in a protein complex are linked by non-covalent protein–protein interactions, and different protein complexes have different degrees of stability over time. These complexes are a cornerstone of many (if not most) biological processes and together they form various types of molecular machinery that perform a vast array of biological functions. Increasingly, scientists view the cell as composed of modular supramolecular complexes, each of which performs an independent, discrete biological function. Through proximity, the speed and selectivity of binding interactions between enzymatic complex and substrates can be vastly improved, leading to higher cellular efficiency. Unfortunately, many of the techniques used to break open cells and isolate proteins are inherently disruptive to such large complexes, so it is often difficult to determine the components of a complex. Examples of protein complexes include the proteasome for molecular degradation and most RNA polymerases. In stable complexes, large hydrophobic interfaces between proteins typically bury surface areas larger than 2500 square angstroms. Many protein complexes are well understood, particularly in the model organism Saccharomyces cerevisiae (a strain of yeast). For this relatively simple organism, the study of protein complexes is now being performed genome wide and the elucidation of most protein complexes of the yeast is ongoing. If a protein can form stable crystal structure of its own (without any other associated protein) in vivo, then the complexes formed by such proteins are called "non-obligate protein complex". On the other hand, some proteins can't be found to create a crystal structure alone, but can be found as a part of a protein complex which creates a stable crystal structure. Such protein complexes are called "obligate protein complex". Transient protein complexes form and break down transiently in vivo, whereas permanent complexes have a relatively long half-life. Typically, the obligate interactions (protein-protein interactions in an obligate complex) are permanent, whereas non-obligate interactions have been found to be either permanent or transient. Note that there is no clear distinction between obligate and non-obligate interaction, rather there exist a continuum between them which depends on various conditions e.g. pH, protein concentration etc. However, there are important distinctions between the properties of transient and permanent/stable interactions: stable interactions are highly conserved but transient interactions are far less conserved, interacting proteins on the two sides of a stable interaction have more tendency of being co-expressed than those of a transient interaction (in fact, co-expression probability between two transiently interacting proteins is not higher than two random proteins), and transient interactions are much less co-localized than stable interactions. Though, transient by nature, transient interactions are very important for cell biology: human interactome is enriched in such interactions, these interactions are the dominating players of gene regulation and signal transduction, and proteins with intrinsically disordered regions (IDR: regions in protein that show dynamic inter-converting structures in the native state) are found to be enriched in transient regulatory and signaling interactions. Fuzzy protein complexes have more than one structural form or dynamic structural disorder in the bound state. This means that proteins may not fold completely in either transient or permanent complexes. Consequently, specific complexes can have ambiguous interactions, which vary according to the environmental signals. Hence different ensemble of structures result in different (even opposite) biological functions. Post-translational modifications, protein interactions or alternative splicing modulate the conformational ensembles of fuzzy complexes, to fine-tune affinity or specificity of interactions. These mechanisms are often used for regulation within the eukaryotic transcription machinery. Although some early studies suggested a strong correlation between essentiality and protein interaction degree (the “centrality-lethality” rule) subsequent analyses have shown that this correlation is weak for binary or transient interactions (e.g., yeast two-hybrid). However, the correlation is robust for networks of stable cocomplex interactions. In fact, a disproportionate number of essential genes belong to protein complexes. This led to the conclusion that essentiality is a property of molecular machines (i.e. complexes) rather than individual components. Wang et al. (2009) noted that larger protein complexes are more likely to be essential, explaining why essential genes are more likely to have high cocomplex interaction degree. Ryan et al. (2013) referred to the observation that entire complexes appear essential as "modular essentiality". These authors also showed that complexes tend to be composed of either essential or non-essential proteins rather than showing a random distribution (see Figure). However, this not an all or nothing phenomenon: only about 26% (105/401) of yeast complexes consist of solely essential or solely nonessential subunits. In humans, genes whose protein products belong to the same complex are more likely to result in the same disease phenotype. The subunits of a multimeric protein may be identical as in a homomultimeric (homooligomeric) protein or different as in a heteromultimeric protein. Many soluble and membrane proteins form homomultimeric complexes in a cell, majority of proteins in the Protein Data Bank are homomultimeric. Homooligomers are responsible for the diversity and specificity of many pathways, may mediate and regulate gene expression, activity of enzymes, ion channels, receptors, and cell adhesion processes. The voltage-gated potassium channels in the plasma membrane of a neuron are heteromultimeric proteins composed of four of forty known alpha subunits. 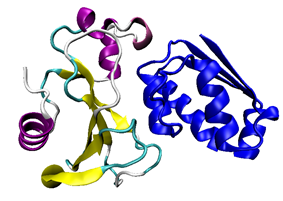 Subunits must be of the same subfamily to form the multimeric protein channel. The tertiary structure of the channel allows ions to flow through the hydrophobic plasma membrane. Connexons are an example of a homomultimeric protein composed of six identical connexins. A cluster of connexons forms the gap-junction in two neurons that transmit signals through an electrical synapse. The molecular structure of protein complexes can be determined by experimental techniques such as X-ray crystallography, Single particle analysis or nuclear magnetic resonance. Increasingly the theoretical option of protein–protein docking is also becoming available. One method that is commonly used for identifying the meomplexes is immunoprecipitation. Recently, Raicu and coworkers developed a method to determine the quaternary structure of protein complexes in living cells. This method is based on the determination of pixel-level Forster resonance energy transfer (FRET) efficiency in conjunction with spectrally resolved two-photon microscope. The distribution of FRET efficiencies are simulated against different models to get the geometry and stoichiometry of the complexes. Proper assembly of multiprotein complexes is important, since misassembly can lead to disastrous consequences. In order to study pathway assembly, researchers look at intermediate steps in the pathway. One such technique that allows one to do that is electrospray mass spectrometry, which can identify different intermediate states simultaneously. This has led to the discovery that most complexes follow an ordered assembly pathway. In the cases where disordered assembly is possible, the change from an ordered to a disordered state leads to a transition from function to dysfunction of the complex, since disordered assembly leads to aggregation. The structure of proteins play a role in how the multiprotein complex assembles. The interfaces between proteins can be used to predict assembly pathways. The intrinsic flexibility of proteins also plays a role: more flexible proteins allow for a greater surface area available for interaction. While assembly is a different process from disassembly, the two are reversible in both homomeric and heteromeric complexes. Thus, the overall process can be referred to as (dis)assembly. In homomultimeric complexes, the homomeric proteins assemble in a way that mimics evolution. That is, an intermediate in the assembly process is present in the complex’s evolutionary history. The opposite phenomenon is observed in heteromultimeric complexes, where gene fusion occurs in a manner that preserves the original assembly pathway. ^ Price NC, Stevens L (1999). Fundamentals of enzymology: The cell and molecular biology of catalytic protein. Oxford ; New York: Oxford University Press. ^ Hartwell LH, Hopfield JJ, Leibler S, Murray AW (December 1999). "From molecular to modular cell biology". Nature 402 (6761 Suppl): C47–52. ^ Pereira-Leal JB, Levy ED, Teichmann SA (March 2006). "The origins and evolution of functional modules: lessons from protein complexes". Philos. Trans. R. Soc. Lond., B, Biol. Sci. 361 (1467): 507–17. ^ a b c Amoutzias G, Van de Peer Y (2010). "Single-Gene and Whole-Genome Duplications and the Evolution of Protein–Protein Interaction Networks. Evolutionary genomics and systems biology". pp. 413–429. ^ Nooren IM, Thornton JM (July 2003). "Diversity of protein-protein interactions". EMBO J. 22 (14): 3486–92. ^ Brown KR, Jurisica I (2007). "Unequal evolutionary conservation of human protein interactions in interologous networks". Genome Biol. 8 (5): R95. ^ Tompa P, Fuxreiter M (January 2008). "Fuzzy complexes: polymorphism and structural disorder in protein-protein interactions". Trends Biochem. Sci. 33 (1): 2–8. ^ Fuxreiter M (January 2012). "Fuzziness: linking regulation to protein dynamics". Mol Biosyst 8 (1): 168–77. ^ Fuxreiter M, Simon I, Bondos S (August 2011). "Dynamic protein-DNA recognition: beyond what can be seen". Trends Biochem. Sci. 36 (8): 415–23. ^ a b c Ryan, C. J.; Krogan, N. J.; Cunningham, P; Cagney, G (2013). "All or nothing: Protein complexes flip essentiality between distantly related eukaryotes". Genome Biology and Evolution 5 (6): 1049–59. ^ Jeong, H; Mason, S. P.; Barabási, A. L.; Oltvai, Z. N. (2001). "Lethality and centrality in protein networks". Nature 411 (6833): 41–2. ^ Yu, H; Braun, P; Yildirim, M. A.; Lemmens, I; Venkatesan, K; Sahalie, J; Hirozane-Kishikawa, T; Gebreab, F; Li, N; Simonis, N; Hao, T; Rual, J. F.; Dricot, A; Vazquez, A; Murray, R. R.; Simon, C; Tardivo, L; Tam, S; Svrzikapa, N; Fan, C; De Smet, A. S.; Motyl, A; Hudson, M. E.; Park, J; Xin, X; Cusick, M. E.; Moore, T; Boone, C; Snyder, M; Roth, F. P. (2008). "High-quality binary protein interaction map of the yeast interactome network". Science 322 (5898): 104–10. ^ Zotenko, E; Mestre, J; O'Leary, D. P.; Przytycka, T. M. (2008). "Why do hubs in the yeast protein interaction network tend to be essential: Reexamining the connection between the network topology and essentiality". PLoS Computational Biology 4 (8): e1000140. ^ a b Hart, G. T.; Lee, I; Marcotte, E. R. (2007). "A high-accuracy consensus map of yeast protein complexes reveals modular nature of gene essentiality". BMC Bioinformatics 8: 236. ^ Wang, H; Kakaradov, B; Collins, S. R.; Karotki, L; Fiedler, D; Shales, M; Shokat, K. M.; Walther, T. C.; Krogan, N. J.; Koller, D (2009). "A complex-based reconstruction of the Saccharomyces cerevisiae interactome". Molecular & Cellular Proteomics 8 (6): 1361–81. ^ Fraser, H. B.; Plotkin, J. B. (2007). "Using protein complexes to predict phenotypic effects of gene mutation". Genome Biology 8 (11): R252. ^ Lage, K; Karlberg, E. O.; Størling, Z. M.; Olason, P. I.; Pedersen, A. G.; Rigina, O; Hinsby, A. M.; Tümer, Z; Pociot, F; Tommerup, N; Moreau, Y; Brunak, S (2007). "A human phenome-interactome network of protein complexes implicated in genetic disorders". Nature Biotechnology 25 (3): 309–16. ^ Oti, M; Brunner, H. G. (2007). "The modular nature of genetic diseases". Clinical Genetics 71 (1): 1–11. ^ Hashimoto K, Nishi H, Bryant S, Panchenko AR (June 2011). "Caught in self-interaction: evolutionary and functional mechanisms of protein homooligomerization". Phys Biol 8 (3): 035007. ^ Raicu V, Stoneman MR, Fung R, Melnichuk M, Jansma DB, Pisterzi LF, Rath S, Fox, M, Wells, JW, Saldin DK (2008). "Determination of supramolecular structure and spatial distribution of protein complexes in living cells.". Nature Photonics 3: 107–113. ^ Dobson, Christopher M (December 2003). "Protein folding and misfolding". Nature 426 (6968): 884–90. ^ a b c Marsh JA, Hernández H, Hall Z, Ahnert SE, Perica T, Robinson CV, Teichmann SA (Apr 2013). "Protein complexes are under evolutionary selection to assemble via ordered pathways". Cell 153 (2): 461–470. ^ Sudha, Govindarajan; Nussinov, Ruth; Srinivasan, Narayanaswamy. "An overview of recent advances in structural bioinformatics of protein-protein interactions and a guide to their principles". Progress in biophysics and molecular biology 116 (2-3): 141–50. ^ Marsh, Joseph; Teichmann, Sarah A (May 2014). "Protein flexibility facilitates quaternary structure assembly and evolution". PLoS biology 12 (5). ^ Levy, Emmanuel D; Boeri Erba, Elisabetta; Robinson, Carol V; Teichmann, Sarah A (July 2008). "Assembly reflects evolution of protein complexes". Nature 453 (7199): 1262–5.